Bach on the violin is perhaps the only remaining enclave in the composer’s oeuvre where partisan views on equipment and style still concede to individual interpretation. Most recently we have seen how Giuliano Carmignola’s infectious ‘period’ Bach is comfortably accommodated in the mainstream (see below) and how Janine Jansen’s selfconscious pluralism never overshadows her tireless spirit of discovery (Decca, 12/13). 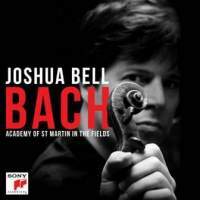 Joshua Bell’s Bach may start from a slight disadvantage, in that the ‘Double’ – the usual companion piece to the two solo concertos – is not included, so we have instead selected single movements and the ubiquitous ‘Air on a G string’. Yet such is Bell’s particular brand of ease with which he mixes traditional sensibility with the lighter articulations and gestures of recent tastes that one is instantly spellbound. The A minor Concerto (BWV1041) is both urgent and radiantly inflected, the second movement mournfully still, hovering over the timeless blend of warmth and litheness which defines the Academy of St Martin in the Fields’ accompaniments. Unerring energy is something of a byword for contemporary Baroque performance, often with a distinct lack of oxygen in the sinews of the lines. Bell is indeed no slouch on tempi – running the show as director – but his harnessing of the phraseology, to find an incremental logic in the long first movement of the E major Concerto (BWV1042), is profoundly gratifying. With close microphone placement in the concertos, the sublime range of overtones from Bell’s violin can tend occasionally towards the strident but it pays off handsomely in an almost unbearably intimate and intense middle movement of BWV1042 and visceral presence in the gleeful abandon of both final movements. Locating small shapes within a larger architecture is one of Bell’s crowning virtues, alongside a depth of sound of almost Henryk Szeryng-like dimensions. As to the curiosities here, the orchestral underpinning of the Chaconne is the coup de grâce, reworked from Mendelssohn’s improvisation, alongside Schumann’s own piano accompaniment to the Gavotte from BWV1006, both orchestrated by the ingenious Julian Milone. Whether or not one is experiencing early-19th-century reception history ‘in sound’ is hard to say but the conception is original and exceptionally executed with searing and soaring artistic intent. One might conclude that a programme of just under 50 minutes is parsimonious but the overall value here transcends mere matters of the clock.